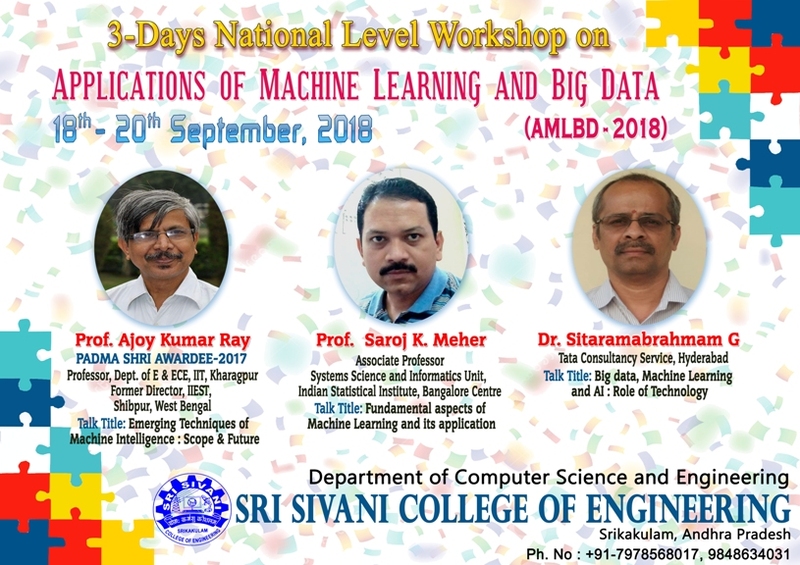 The Department of Computer Science & Engineering of Sri Sivani College of Engineering was established in the year 2006 and playing a vital role in designing, developing maintaining software and hardware for the entire college. It has been offering full time B. Tech (CSE), M. Tech (CSE) and M. Tech (SE) courses. The Department has been advancing at a rapid pace with the acquisition of advanced facilities and dedicated teaching faculty to properly motivate and mould the students for a better and prospective tomorrow. The Department is adequately equipped with several full fledged computer laboratories and research groups in order to enhance R & D and consultancy. The department has started with an annual intake of 60 seats. The intake was increased to 120 from the academic year 2007-08. A Post Graduate program M. Tech in Software Engineering was introduced in 2010-11 with an intake of 18 seats. One more discipline of Post Graduate program M. Tech in Computer Science & Engineering was started in 2012-13 with an intake of 18 seats. CSE Department Laboratories are well equipped with Dual Core clients running on Windows and Fedora Operating Servers, Oracle Servers and Xeon servers with all licensed software’s. The systems are connected through 100/1000 Mbps CAT 5 UTP cabling and fiber connectivity, high-end routers and switches of 40Mbps internet facility with LAN and Wi-Fi. The laboratories are established with an objective to promote practical knowledge in latest cutting-edge technologies, research and consultancy work. The objective of the department is “To develop efficient and dynamic Computer Science Engineers with academic excellence, effective communication skills, leadership qualities, research methodologies, professional ethics and morals, and high integrity to serve the interests of the society and nation”. Strive to be a center of eminence for developing holistic computer science professionals. PSO1: An ability to qualify in National Level Competitive examinations for successful higher studies and employment. PSO2: An ability to deal with real time models, languages and operating system. To contribute to the advancement of knowledge, in both fundamental and applied areas of Computer Science Engineering. To forge mutuality beneficial relationship with industries and governmental entities to develop sustainable computing solutions for the benefits of the society.